What do you get when you add protein powder to already-protein-packed Greek yogurt? Super yogurt! 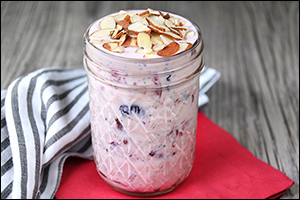 In a medium jar, combine yogurt, protein powder, milk, and cinnamon. Mix until smooth and uniform. Stir in chia seeds. Top with cherries and almonds, or stir them in. In a medium microwave-safe bowl, mix apple with 1/8 tsp. cinnamon. Cover and microwave for 1 1/2 minutes, or until apple has softened. Add oats, almond milk, sweetener, and remaining 1/8 tsp. cinnamon. Mix well. Cover and refrigerate for at least 8 hours, until oats are soft and have absorbed most of the liquid. 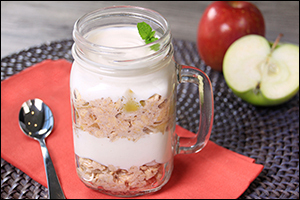 In a medium jar, layer half of the oatmeal followed by half of the yogurt. Repeat layering with remaining oatmeal and yogurt. Hungry for More Recipes in Jars? Because your buddies need breakfast, just like the rest of us. Click "Send to a Friend" to pass along these recipes!